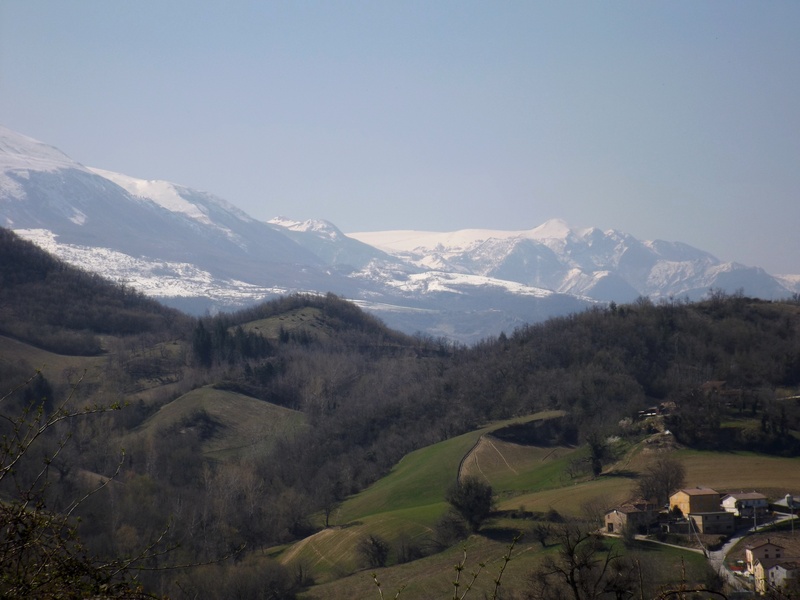 After we finally got out of Rome, we made our way to an area of Italy called Le Marche, where we were staying for just under two weeks with our next Workaway family. Jodie and Kevin – originally from the UK – live on a small farm with their 14-month-old son Charlie just outside of a little village called Comunanza. 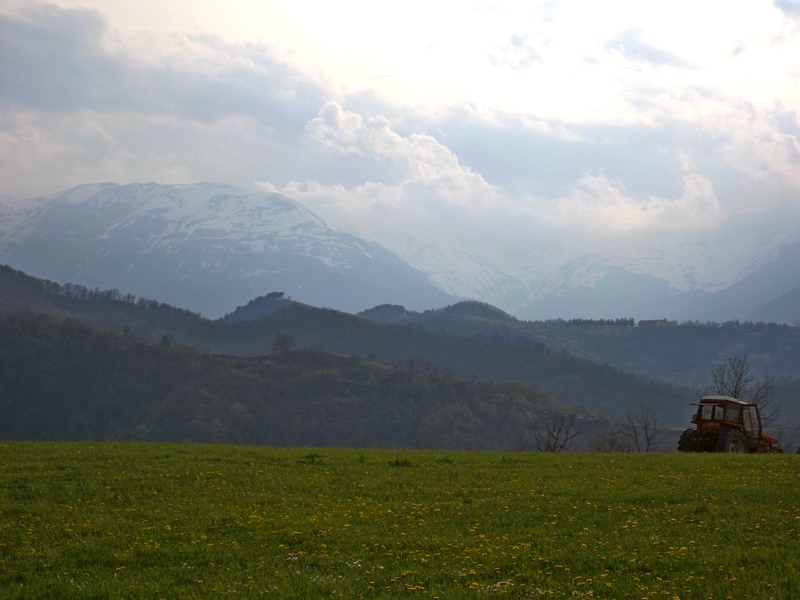 Situated close to Monti Sibillini National Park, the area is stunning: Jodie and Kevin’s farm is just 3km away from the village but is rural enough to afford stunning views of the surrounding countryside, tall trees and – even more beautiful – snowy mountains. 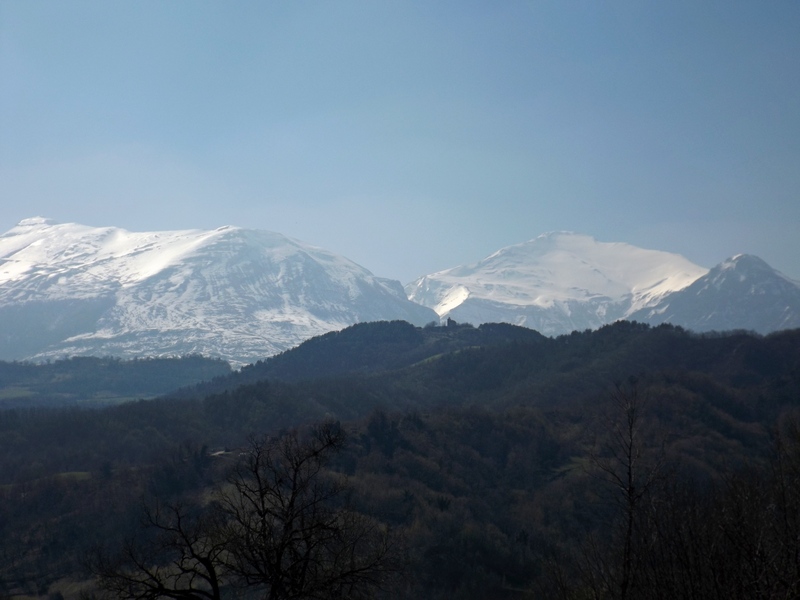 In terms of weather we were very lucky, with most days reaching 18-20 degrees Celsius, with clear blue skies and small fluffy clouds hanging above the snow-covered mountains. However, it had been snowing heavily on the day that we arrived. This made the bus journey slightly interesting. After being dropped off of the first bus quite suddenly at a petrol station during a blizzard, we waited patiently (sort of) for a minibus to arrive and pack us in. It must be said that the driver was a bit of a legend. The unending snow obviously did not worry him at all as he drove through mountain passes up and through the nearby mountain range. The Italians are obviously well-prepared for the weather: the road had clearly been ploughed quite recently, and we saw another snow plough half-way through the journey. Any fears we may have had (or, that I may have had – Phil wasn’t remotely fazed) were abated by the presence of an emergency vehicle driving slowly behind us and checking for any trapped cars on the road. On the farm they’ve currently got seven ducks, two goats and over 20 chickens, all of which are free range in the truest sense of the word. Often we’d have chickens and goats wandering over to us as we worked on the land: I spent a couple of days hoeing and weeding a veg patch and was accompanied almost constantly by one particular chicken which was bizarrely raspy and croaky – you could hear her approaching you minutes before she appeared. I affectionately termed her Christian Bale thanks to her batman-like raspy voice and enjoyed throwing Bane and Joker quotes at her as she pecked around in search of worms and bugs whilst I weeded. We were given the morning off of ‘work’ one day during our second and final week as our hosts were out running errands and offered to drop us at a nearby village for us to see some more of the local area. Servigliano covers an area of just 18.5 square kilometres and has two main parts: the part which is inside the old walled village and the rest of the village outside, which has the appearance of an affluent area given the plethora of large, attractive houses set back from the wide tree-lined streets. The buildings inside the walled village, which you can access through one of the grand archways, are on a smaller scale but even prettier; we spent a couple of hours wandering around gazing at the old houses and shops in this quiet and peaceful village. Comunanza is a pretty enough place, with an older part of the town full of ancient and almost derelict looking buildings and a church, which you can access using a small and equally ancient looking bridge. Our main activity on our afternoons in the village, however, was eating gelato and drinking cappuccinos at the central bar which is run by a very friendly family which our hosts know well. The home-made ice-cream changed every couple of days and I took it upon myself for the sake of hard-hitting journalistic research to test out as many as possible. The Ferrero Rocher ice-cream was certainly a winner, but the best ice-cream award had to go to their crème catalana. Our Workaway hosts had also befriended a lovely Italian woman who had lived for many years in Canada, who since moving back to Italy had been running her own pizza restaurant and take-away business. We went there for dinner one evening and it was great to be able to try some proper, genuine Italian pizza rather than the tourist rubbish you tend to get sold in Rome. Still on the subject of food – as it would be unfitting for this blog to devote any less than two paragraphs to my favourite topic of conversation – we spent a weekend in Ascoli Piceno after leaving our hosts, which is renowned for the ‘olive all’ascolana’ – a snack made of olives stuffed with mixed meat and covered in breadcrumbs. These are easy to buy in Ascoli itself though their popularity extends beyond the city meaning they can be purchased in numerous nearby towns and cities. Continuing with my daily ice-cream eating routine, I tried out some different flavours whilst in Ascoli and I’d have to award the pistachio ice-cream from Yogurteria Yoghi the number one prize. With much of its medieval roots clearly displayed in its plazas, churches and houses, Ascoli Piceno is a stunning place to spend a couple of days. It has a number of museums and galleries including the Archeological Museum and the Civic Art Gallery, but we were enchanted enough with the place (and, as always, too cheap) to simply wander through and around the town taking in the sights. Ascoli is surrounded by a number of portas, old arched gateways, perhaps the most notable of which is the Porta Gemina, dating from the 1st century BC. The river Tronto, which crosses the city and meets with a small river – Castellano – on its way also makes for an enjoyable stroll. At this time of year, however, following the harsh winter weather, there had been a number of landslides and fallen trees in the local area, and our peaceful walk by the river turned into a hazardous obstacle course as we dodged around the fallen trees and shrubs. 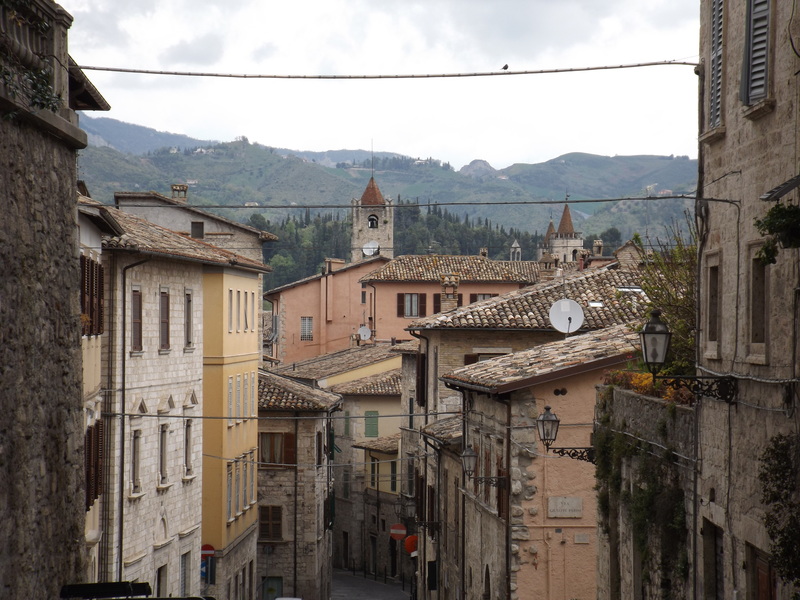 It’s worth mentioning two excellent websites which we used for the first time in Ascoli Piceno, and which undoubtedly improved our experience: AirBnB.com and BlaBlaCar.com. With AirBnB you can find rooms, B&Bs and entire houses and flats to rent, sometimes from family-run hotel and B&B businesses, but more often from local people who have spare rooms or apartments which they let out to holidaymakers. We stayed in a studio flat in quiet cobble-stoned street in Ascoli which is owned by a local woman and her husband, and it was great not only to have our own space but also to be in a normal street full of normal residents going about their daily lives. BlaBlaCar allows you to ride-share with people making short and long journeys who have spare seats in their car. Through this we were able to get from Ascoli to Florence (Firenze) much cheaper and quicker than by bus, and we shared our journey with a policeman who lives in Ascoli but works in Florence and a Brazilian girl currently living in a town just outside of Firenze. I’m sure I’ll be mentioning both of these websites again – hopefully with more good reports! – as we plan to use them again in the rest of our travels. Until next time, thanks as always for reading.